An intensive two day workshop where you will be brought up to speed with React development. You will leave with the understanding of React, associated frameworks, techniques and browser development in general. Many of the concepts in React come from functional programming and your will get a better understanding of this as well. You will learn to be proficient in creating React applications for the web and the basics for getting started with React-Native. We also offer a complete course in React-Native. 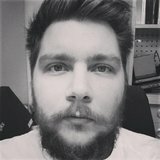 Max Malm is a senior developer with Trifork and has great experience working with web development. In recent years he has been focusing on React and React Native. What is React and what use-cases are there?